An image or a picture can trigger memories, beliefs and imagination. Here are my offerings. In our lives, there are many doors, some open to joy or insight, some to sadness, pain or loss. Life takes no notice of who you are or what your plans may be. Infinity shown as openings or archways can also represent hope that perhaps the next opening will lead to better times. The road continues whether we fall by the wayside or not. Sometimes there is a choice at the fork in the road and at other times, we are at the behest of Fate. The traffic is a parade. Nuit Blanche (White Night) is an arts festival or city party which provides 'after hours' free access to various forms of culture. Film, visual art and performing arts are staged at outside venues and certain galleries and locations. The Nuit Blanche is celebrated in the first week of October in Paris. This image was captured from the fourth floor of a residential apartment building on the Rue de Rivoli. Have you ever heard the term Nuit Blanche? Have you heard of the Dry Tortugas or Garden Key? Do you find it easy to be inspired by an image? Please leave a comment to let me know you dropped by and I'll respond. I apologize for the brevity of my entry to this month's challenge, fiction was not an option. Join us for a monthly signup and some very interesting reading. It's flexible. I joined the once-a-month bloghop since it meets my needs. WEP can help you practice short writing. It's a good way to start story ideas. Don't forget to visit the other posts on the July signup. Photographs by DG Hudson and Green Eye. It is very much so, Hayley-Eszti. It is isolated 70 miles off Key West, Florida in the Gulf of Mexico. The park restoration workers and the birds are the inhabitants now. Glad you like it Optimistic Existentialist! I can't resist repeating patterns in images and the idea that the road does go on forever. I would have taken that exact same picture of the arches; I have a similar one from Fort Point in San Francisco! Hope you post it some day, JoJo. You must like repeating patterns, too. You explain it so well, Lisa! I didn't know about the Fete de Musique, that would appeal to me too. I read your comment on Lee's blog about your husband. I am so sorry about his heart attack, but am glad that he is okay now. Or recovering. I imagine that you were thinking of that when you wrote this bit. One never knows when Life is going to throw that curve ball! I definitely was thinking of hubs after I chose that photo. Thanks for your kind words, Robin. That curve ball reference is apropos, as hubs is a baseball fan from way back, something that's hard to find in Canada. 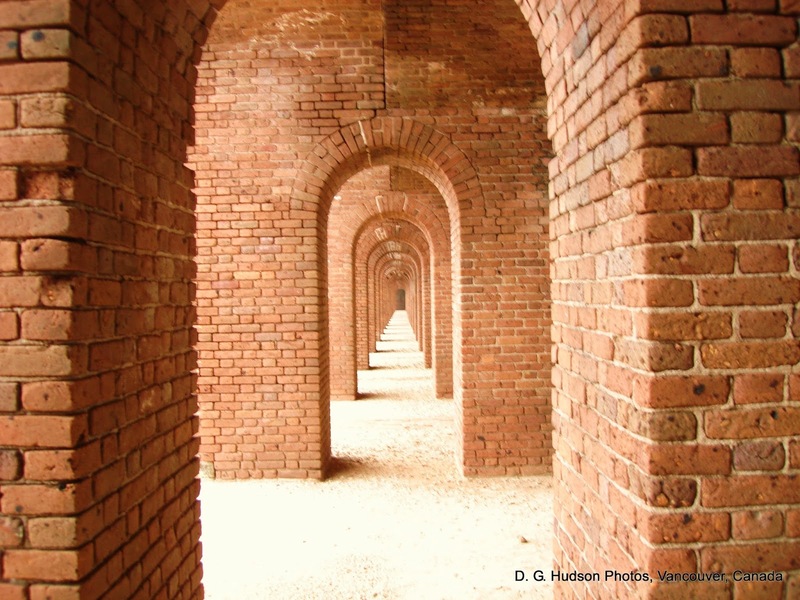 The archways of Fort Jefferson leave one lost in reflection. You took a beautiful picture of it. Most of those doors of pain you mention sadly are only one person wide. Yet friends await us on both sides of those doors. The doors of Joy, on the other hand, are usually two people wide -- and so doubles the joy, right? Somehow that image is calming for me, yet another one of the archways where the cannon were kept and fired from was more ominous. You describe doorways of life so well, Roland, and friends do help, sometimes more than they can know. Thanks for visiting. Thanks, Alex, I love it too. The fort also has a lighthouse on the top, and the barracks have a sample place showing where they slept. It's a fascinating place, and an adventure getting there. Good to see you back on your blog again. I love those arches and I don't think I've heard of any of the things you mention this time. Hi Inger, I'm glad you like the photo, and if you learned of something new, so much the better. I'm here sporadically at least. . .
Read your comment at 'Tossing It Out' and came right over to express my sadness are your husbands illness. It sounds like things are going as well as can be expected and you have the situation well in hand. I pray he will see a full recovery soon and that you will have the strength to give him the help he needs to come through this. These are great pictures as usual. I am familiar with the Dry Tortugas, as well as many of the old Forts and Prisons in the Caribbean. Such lovely structures for such a purpose. I also know enough French to know the term Nuit blanche, but did not know about the wonderful festival. I would love to see that sometime. Thanks, FAE, I can use all the good wishes and prayers that are offered. It's the hardest thing I've ever faced. I appreciate the kind words more than you know. Fort Jefferson was an intriguing place to visit, where they grew their own herbal medicines, too. Hi D.G. Thanks for taking the time out of your busy schedule to share these amazing photos. I've somehow missed the Nuit Blanche, but it sounds fascinating. I love those infinity archways which (I might be wrong) I think originated in Moslem countries, but have proliferated in so many places. My favourite is on top of the hill in Mont St Michael in France. Have some great pics of that one. Thanks for your lovely share...and sharing WEP also. I've had that happen with Blogger, so I go back and change one tiny thing in the post and update. I have better luck scheduling, so I do that now, most of the time. Perhaps Google is having a conundrum. . .
Lovely photos - the archways, never knowing where life may take us and the Paris party at night - great fun. Wishing your husband a speedy recovery. Thank you Sally. Glad you like the photos. Couldn't do fiction this time. . .but love photography. Lovely pictures! It's true that sometimes there's a fork in the road and we have choices, and at other times, we just have to go wherever fate chooses to take us. Love the first photo. I took a similar one at the fortress in San Juan, Puerto Rico in April. I love it so much, I have it as my screen saver on my computer. Thanks, Michael, you must have a good eye for images, too. (considering your art background). Nuit Blanche was a surprise to us too, and it is in early October that it happens in Paris starting sometime around midnight. It happened on our last night in Paris, almost like a send-off party. The first photo is irresistibly beautiful! I didn't know about Nuit Blanche, and I especially liked Lisa's comment explaining it. Glad you like, Nilanjana, and I appreciate the good wishes. Both hubs and I like taking photos of places we've travelled to. Loved the images and no, I've never heard of either one. Thanks for sharing such insprational photos. Oh yes, I am inspired by paintings and photos. I feel the same way about painting and photos, too. Glad you liked the images, NR since my fiction well was low this month. Thanks, Donna, I like photographs that seem as if I could walk into the image, like the archways. The human mind is intrigued by what we can't see at the end of that road to infinity. Oh; I hope your husband is recovering DG. Take care of you and him. I'm trying to, Donna. I appreciate the hope, and it's what I cling to. Love pictures like that door to infinity one up there - they really make you stop and think ... about everything! Several other cities also have this Nuit Blanche type parties, check the links if you're interested. Of course the city admin must have a cultural frame of mind to back such a venture. Bravo for Paris! Hi DG - I'm sorry to note about your hubby, however the good news is he's recovering .. I like the Nuit Blanche concept - something I certainly hadn't heard of ... and then Lisa's extra explanation. Thanks for your comment. I will email soon, I have just been soooo tired. I understand. Worry and stress take a lot out of us. Today I'm taking in photographs when I visit, as a memory jog. A nurse suggested it. The photos worked well, and bringing his glasses did too. I posted his favorite where he can see it. I asked him if he wanted a family photo and he said yes. Things are looking up and that feels good. Pictures are a great source of inspiration -- depending on the picture, I suppose. Nuit Blanche sounds awesome. I'm all about free. Praying for your hubs. I think it encourages more people who wouldn't attend galleries or museums to learn to appreciate all forms of art. It's a festival type atmosphere. Thanks, Milo, also for any extra energies sent hubs way. Greatly appreciated.